My friend Tina passed on this recipe to me. She was looking for a healthy snack for her daughter, who's dairy intolerant. She ended up making quite a few changes to the original recipe. Tina reduced the amount of sugar and oil used and added applesauce. If your little one needs more calories, follow the original more closely. Be forewarned, these aren't meant to be cookies, therefore, they aren't super-duper sweet -- which is perfect for little ones. Preheat oven to 350. Spray nonstick cooking spray into each muffin cup. Mix brown sugar, oil and eggs in a large bowl until smooth. Combine the flour and baking powder in a separate bowl. Stir flour/baking powder mix and remaining ingredients into the sugar/oil mixture. Drop a heaping tablespoon of batter into each muffin cup. 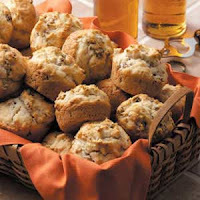 Spread batter with spoon or fingers to evenly cover the bottom of the muffin cup. Bake until edges are brown, about 12 minutes. Let sit a few minutes in the muffin pan then remove for complete cooling. Makes approximately 48 granola circles. Another recipe from Laura. If you can't find MSPI-friendly bouillon granules, substitute 2 cups of safe chicken broth for the water and the bouillon. In a large skillet, brown sausage in butter; remove with a slotted spoon and keep warm. In the drippings, sauté the onion, peppers and celery until tender. Stir in the remaining ingredients. Bring to a boil. Reduce heat; cover and simmer for 15 minutes or until rice is tender. Return the sausage to the pan; heat through. My friend Laura passed on a couple of recipes to me. The original recipe calls for 1 teaspoon of Worcestershire sauce, which isn't MSPI-friendly. So just leave it out, or try substituting 1 teaspoon of A-1 Steak Sauce. Also, be sure to double check all the products you use to make sure they're safe as well. Cook beef and onion in a large skillet until meat is brown. Drain grease from pan. Run cold water over the frozen vegetables until they separate. Add vegetables and ¼ cup water to the skillet with the beef. Cover and cook until vegetables are tender, about 10 minutes. Stir in the soup, A-1 sauce and thyme. Transfer mixture to a 1 ½ quart casserole baking dish. Top with tater tots. Bake for 25-30 minutes, until hot. I was at the library yesterday, perusing the cookbooks. Saw one I've checked out before, "New Flavors From Your Crockery Cooker" by Better Homes and Gardens, and remembered that it had a ton of great recipes in it. So, I checked it out again, but this time I'm focusing on MSPI-friendly recipes. The following recipe is one I made a few years ago when I had the book before. It's excellent and would work really well for company. Just serve the feta cheese on the side for those who can eat it. Rinse chicken; pat dry. Cut chicken thighs into quarters. In a 4- or 5-quart crockery cooker place the onion and garlic. Top with the chicken pieces. In a bowl combine the undrained tomatoes, tomato paste, wine or broth, lemon juice, bay leaves, salt and crushed red pepper. Pour over all. Cover; cook on low-heat setting for 6 to 7 hours or on high-heat setting for 3 to 3 1/2 hours. If using low-heat setting, turn to high-heat setting. Remove bay leaves. Stir in shrimp and artichoke hearts. Cover; cook for 5 minutes more. Serve chicken and shrimp mixture over hot cooked orzo. Sprinkle with feta cheese. My daughter has swim lessons tonight, so I figured a slow cooker recipe would be perfect, in case things get hectic. This recipe from A Year of CrockPotting is bubbling away as I type this entry. The house smells great! I'm planning to serve it with tortilla chips and carrot and celery sticks. Is it dinnertime yet? MSPI-friendly bread (beyond your basic Italian white) can be hard to find, and when you do, it's usually quite expensive. I must admit, I am very fortunate, thanks to Rotella's Italian Bakery. All their bread is dairy-free and certified Kosher, and I have yet to come across any bread that has soy flour in it. Their factory and outlet store is located only a few minutes from my house. I go there, load up on several loaves for a very cheap price (85 cents a loaf!) and throw it in the freezer. I know, I am soooooo lucky! I've even been hesitant to write about it on the blog because I didn't want to brag! Well, you're in luck, too! I was checking out Rotella's website (where they post all their ingredient info) the other day, and found that they sell several types of their bread by the case and mail it to you! You too can have this awesome bread! OK, you do have to buy a case, but just throw it in your freezer. Trust me, their bread tastes great, even after being frozen for a couple of months. Just so you know, you won't be able to buy it as cheaply as I do. You'll probably end up paying about $2 a loaf, but that's still a good price. I highly recommend the Wheat Berry. It's to die for. If you've ever had an Arby's Market Fresh sandwich, that's the bread. So yummy! If you end up buying some bread this way, leave a comment and let me know how it worked out for you. That way the other moms who read this will know, too! I’m often asked the same questions over and over by parents who are new to MSPI. I thought I would go ahead and answer some of them here. If you have a question that you don’t see answered here, leave a comment, and I’ll do my best to answer it. Remember, I’m not an expert, just a mom who has “been there, done that”! I’ve taken dairy and soy out of my diet, and my baby is still having a reaction. What gives? Keep in mind that it can take two to four weeks for dairy/soy to completely leave your system as well as your baby's. If you've only been on the diet for a few days, then you may just need to give it more time. I know, I know ... your patience is running pretty thin by this point, but hang in there! If you've given the diet plenty of time, first thing you should do is double check the ingredients you use. For example, chicken broths often contain dairy or soy. Always, always read labels! Don’t take my word for it that something is safe. You are ultimately responsible for what you eat! Second thing you should do is double check the ingredients in any medications or vitamins that you (or your baby) are taking. Lactose is often used in medications! RxList is really helpful. A third thing you should do is double check the prepared foods you are eating. The ingredient lists may not list dairy, but cross-contamination is very possible. Familiarize yourself with Kosher symbols. They are a good indicator of what is or isn't dairy-free. If there's a D or DE listed next to the symbol, then that means there's dairy in the item or it was processed on equipment that also processes dairy -- thus cross-contamination. Also look for the words parve or pareve. That means it is certified dairy-free! Another problem could be that your baby may have intolerances or allergies beyond milk and soy. Keep a food diary and try to correlate your baby’s reactions to what you’ve been eating. You can try eliminating other foods from your diet. Some you might try include beef, gluten, eggs and peanuts. Remove one at a time and see what happens. Another option would be to try the Elimination Diet. Soy(bean) oil and soy lecithin are common ingredients in a lot of the food you use in your recipes. Are they safe? For most MSPI kids, soy oil and soy lecithin (an emulsifier) are OK because they don't contain protein, but some kiddos still react to them. You'll just have to figure out what works for you! Do you have a list of MSPI-friendly foods? I don't have a list of foods available, and I'm not going to type one up. Why? Because what's MSPI-friendly for me may not be MSPI-friendly for you because of soy oil, lecithin and cross contamination. Remember, you are ultimately responsible for what you eat. I've actually received messages from people who were angry with me because a product I use wasn't safe for them, and I don't like hate mail! So sorry, you can blame them for the lack of list. I also feel it is incredibly important that you get in the trenches and read ingredient labels. Yes, it's difficult and time-consuming. I've been there! But you won't become efficient at it without practice. Also, manufacturers are notorious for changing recipes and formulations of their products. What may be MSPI-friendly one month, may not be the next, and the formulas can vary depending on where you live and where the products are manufactured. I'm happy to share what products I use (and I have a few listed in the following FAQs) on an individual basis, so feel free to drop me an e-mail and ask about individual products -- not a list. You can also check out the Product Spotlights thread under the Discussions tab on my Facebook page. What MSPI-friendly chocolate chips do you use? My favorite chocolate chips are the 365 brand of vegan chocolate chips at Whole Foods. Also, Enjoy Life Foods' chocolate chips are completely dairy and soy free. There's a store locater on their website. If your baby can handle a small amount of milk through cross contamination, then you might be able to use Ghiradelli's semi sweet chocolate chips, which are available in lots of stores. What MSPI-friendly margarines do you use? I’ve used Bestlife Foods Buttery Spreads, Fleischmann’s Unsalted stick margarine, Blue Bonnet Light stick and tub margarine, and Smart Balance Light tub margarine. For baking, I get better results when I substitute butter-flavored Crisco for butter, rather than using margarine because there’s too much water in the margarine. I've also heard great things about using coconut oil as a substitute for butter in recipes. What MSPI-friendly breads and buns do you use? Since starting this diet and hearing from all of you, I've come to realize that the bread for sale in the grocery store is very regional. For example, I use Rotella's bread and buns, but it's a local bread maker here in Omaha. Unless you live in the surrounding area, you probably can't get it. If you've looked at every single bread offered at your store (including the freezer section for bread dough) and still come up empty, you can look outside your store. Check your local bakery. Maybe they have something you can eat. Or what about making your own? 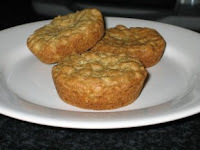 There are several recipes on my blog you can try or look into getting a bread machine. You won't regret one of those machines. They're simple to use and the bread you make is super delicious. Any advice on eating at restaurants? Several of the fast food and chain restaurants post allergen/ingredient information on their websites. Check them out and compile a list of the foods you can eat from their menus. Keep in mind that restaurants have been known to change their recipes and ingredients, so update your list periodically. If a national restaurant doesn’t post ingredient information on their website, try contacting their customer service department. For links to restaurants' allergen information, check out the Discussions area of my Facebook page. If you’re eating at a local restaurant, try calling ahead to talk to someone in their kitchen. They are often more than willing to talk over menu options with you, especially if you call at a slow time of day. The most important thing to remember is that despite what a restaurant's ingredient information may say, mistakes can be made by restaurant personnel and cross-contamination is always a problem. When in doubt, only eat food you've prepared! I’m going on vacation, any advice? Take along items you know you can eat – especially anything you might have a hard time buying at unfamiliar stores. I always bring MSPI-friendly bread, margarine and rice milk. And when possible, stay at a place that has access to a kitchen of some sort. Condos often have full-size kitchens, and many hotel rooms now offer microwaves and refrigerators. You can prepare your own food that way. I’m having a hard time juggling my family’s meals and my meals. Any advice? The best advice I can offer is to do what my family does: Our family meals are all MSPI-friendly. I don’t have time to cook two meals for every dinner. How exhausting! The trick is to prepare tasty "normal" meals that don’t require milk or soy. My husband and oldest daughter still drink milk and eat yogurt, ice cream and cheese on their own, but our dinner every evening is something all of us can eat. The majority of the recipes on this blog are intended for the entire family. I’ve relied on prepared foods in the past because dinnertime is so hectic around my house, and since most prepared foods aren’t an option now, I’m really struggling with getting dinner on the table. Any advice? 1) Utilize your freezer. Double, even triple, recipes that are safe for you to eat and put the extras in the freezer. You can do the cooking during nap time, evenings after the kids are in bed or weekends when you have more help around the house. That way they can thaw during the day and are easy to reheat at dinner time. 30 Day Gourmet has a lot of good information about freezer cooking and recipes that can be adapted to the MSPI diet. This page over at Once a Month Mom is also super helpful with lots of dairy-free recipes, just avoid the soy. 2) Grill out! Now that the weather is getting nice, utilize your grill. Marinate a bunch of chicken breasts/steaks/pork chops/etc. and grill them when convenient. Cut up the leftovers for salads/other meals. Again, store them in your freezer. 3) Do some slow cooking. 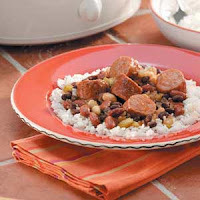 Find slow cooker recipes that are safe for you, throw the items in the slow cooker in the morning, and a meal will be ready for you at dinnertime. You can even do your prep work the night before if mornings are hectic for you. A Year of CrockPotting is a great blog full of recipes that can be adapted to MSPI cooking. Some of your recipes are marked as Vegetarian, but they call for chicken broth and other meat ingredients. That's not vegetarian. If I've marked something as Vegetarian, it means the recipe is already meat-free or can be easily adapted to meat-free by substituting vegetable broth for chicken broth or leaving the meat out. I have faith in your abilities to figure it out! I already have a child with MSPI and am expecting again. Will going on the MSPI diet during the pregnancy make a difference, and if so, when should I start? There really isn't any conclusive evidence that I've seen about how being on the diet prior to birth affects the baby. I've heard from moms who swear by it and others who saw no difference. However, I can share with you my personal experience. I went on the diet one month prior to birth. By doing this, I knew my milk would be clean from the get-go, making reactions minimal. I figured that if my baby was completely symptom free by 2 months old, I would try some dairy and watch for a reaction. However, I had a small slip-up in my diet when she was a few weeks old and she reacted. Her reaction was minimal and it only took a few days to clear up, as opposed to the weeks it took my son when he was a newborn, since my system was so full of dairy then. Life was so much easier the second time around! My baby is 6 months old today! Wow! Where has the time gone? I can't believe I've been hanging in there with this crazy "diet" for nearly half a year. One thing I've really missed this summer is ice cream, so when I saw this recipe on the "I'm an Organizing Junkie" blog, I just knew I had to post it. I haven't had the chance to try it out yet (I'm out of marshmallows.) but I will as soon as I can make it to the store. I'll let you know how it turns out! 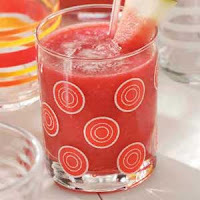 This recipe from the Associated Press just screams summer to me. Light and fresh flavors with a relatively simple preparation. Plus, all those veggies! You can substitute cooked chicken for the shrimp or skip the meat and use vegetable stock to make it vegetarian. In a large skillet with a lid, heat the oil over medium high heat. Add scallions and cook, stirring, for 1 minute. Add the broccoli, zucchini and bell pepper. Cook, stirring often, until the vegetables begin to soften, about 5 minutes. Stir in the curry powder, salt and pepper. Add the chicken broth and increase heat to high. Cover and bring to a boil. Stir in the shrimp, then add the couscous and stir to combine. Remove the skillet from the heat, replace the cover and let stand for 5 minutes. Fluff with a fork and serve. I don't know about you, but I always have a bunch of bananas hanging out in my freezer. They usually end up there because my daughter insists that I buy bananas at the store and then she never eats them. So I'm always a fan of any recipe that uses those suckers up. This recipe from RecipeZaar fits the bill but also is quite healthy and is MSPI-friendly. Great for snacking! Sorry about the lack of updating; I've been out of town for several days. That's summer for you! Anyway, here's a fabulous-looking recipe from the "Full Bellies, Happy Kids!" blog. No substitutions necessary! Another kid-friendly recipe from Taste of Home that Tina recommended. Just be sure to double check your hot dogs for milk and soy, and substitute oil or dairy-free margarine for the butter. My friend Tina passed along a couple of kid- and MSPI-friendly meals. This recipe from Taste of Home is also super easy to prepare because you throw everything in the slow cooker. If you can't find MSPI-friendly bouillon, just substitute 1 cup of safe chicken broth for the bouillon and water. 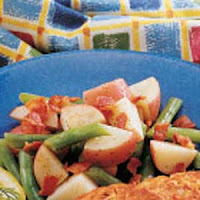 Take advantage of summer's fresh green beans for this yummy side dish. This recipe from Taste of Home has bacon in it, so you know I love it! Most succotash recipes contain butter and cream, but this recipe from Cook's Country drops the dairy and opts for a vinaigrette that's light and fresh. This salad can be kept covered and refrigerated for up to 1 day. If making the salad in advance, add the basil just before serving. Stir oil, lemon juice, honey, red onion, and salt and pepper to taste together in small bowl. Bring 2 1/2 quarts water to boil in large saucepan. Add 1 teaspoon salt and green beans and cook for 1 minute. Add corn and lima beans and cook until tender, about 5 minutes. Drain vegetables into colander and rinse under cold running water until cool. Drain vegetables well and transfer to serving bowl. Toss vegetables with dressing to coat evenly. Stir in basil and season with salt and pepper. Serve. 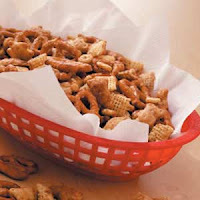 This recipe from Taste of Home would be great for snacking on while hanging out by the pool or watching fireworks. Just substitute dairy-free margarine or oil for the butter. If you're planning to attend a party over the holiday weekend, chances are there will be a veggie tray and you won't be able to eat the dip. So bring your own dip! I found this recipe on RecipeZaar and thought it looked pretty good. Just make sure your mayonnaise is MSPI-friendly. My hubby has to work on the Fourth of July, so I've decided to take it easy on myself and make dinner in the slow cooker. This recipe from A Year of CrockPotting fits the bill. Just make sure you use MSPI-friendly barbecue sauce. John absolutely adores ribs, so I'm sure I'll be his hero after he eats this! This recipe from Taste of Home offers a nice snack for the holiday weekend. With the Fourth of July three-day weekend just a few days away, I thought I would post some recipes that would help you have a fun and delicious holiday! When everyone else is having ice cream, this recipe from Taste of Home should help quench your thirst and keep you from feeling too sorry for yourself!